Necrotizing fasciitis (NF) is a severe infectious condition associated with significant morbidity and mortality and characteristically has a higher incidence in adults; pediatric cases are very rare. In this case report International Journal of Surgery Case Reports describe, the clinical presentation, management and outcome of a patient with necrotizing fasciitis of the neck and head complicated with chronic osteomyelitis. 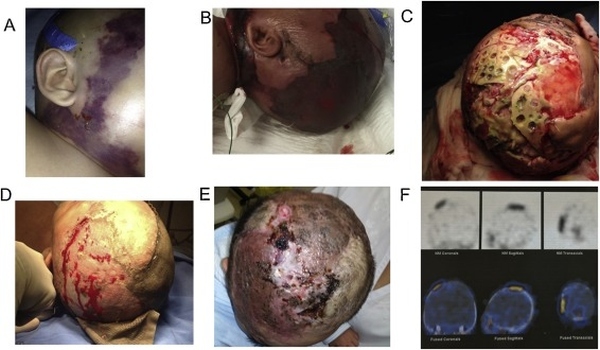 An 18 month-old, latin, male, diagnosed with rickets and Crouzon syndrome, twenty-four hours post- craniofacial remodeling surgery presented tissue edema, indurated skin and violaceous and well delimited lesions in the neck and head. The patient developed septic shock, acute osteomyelitis and infection of the cranial grafts. Multiple surgical lavages, debridation of the necrotic tissue and resection of the affected bone, in combination with multiple antibiotics, laboratory test methods, VAC therapy and hyperbaric oxygen were required for successful treatment and full recovery of the patient.